I finally dragged myself to the gym on Tuesday to hit the treadmill. I don’t know what they do to the treadmills at this place, but it almost feels like I’m running harder than I do outside and at slower speeds. They also keep the temperature in the gym up, so I was all kinds of sweaty after 4 miles. Like I haven’t been that sweaty after a run since like July. Anyway, I completed day 3 of week 9 of Couch to 10k. I had good intentions about returning to the gym, but on Wednesday I had a hair appointment and Thursday was Halloween. I have no real excuse for Friday, but Saturday I shot a wedding. So, Sunday I went out for my long run of seven miles. 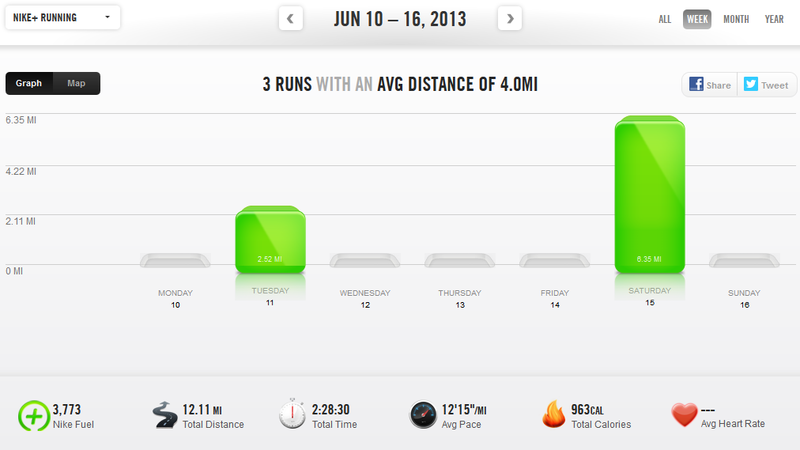 I knew this would be the longest distance I had ever run at once. The weather was cool, the scenery was pretty. I put on my Nathan hydration pack for the first time and headed out to the greenway. I don’t know what happened. I don’t know if I went out too fast or if the hydration pack was just a lot of added weight I wasn’t used to. Maybe it was the cooler, drier air. Certainly the fact that I had forgotten to take my Advair that morning played into it. But right around the end of the first mile, my asthma decided to show up. I haven’t had issues with my asthma in months. Therefore, I had (stupidly) stopped carrying around my inhaler when I ran. But here it was in all its wheezy gloriousness. So I had to slow to a walk. I ran when I could, but those seven miles were very hard earned, with a lot of walking. 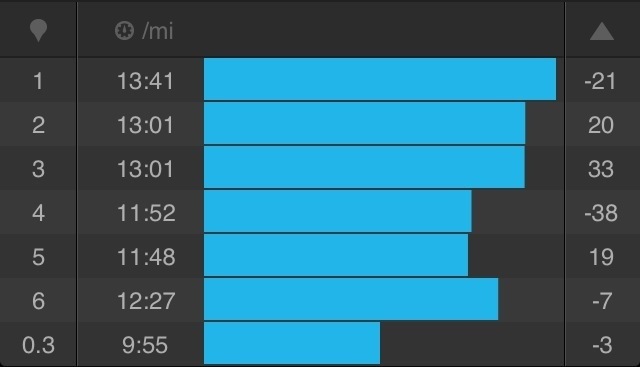 While I completed the first mile in under 12 minutes, my subsequent splits were all closer to a 14 min/mile pace. By the end, my chest was hurting from trying to breathe. My back was hurting, probably from the same reason, with the added bonus of toting around 2 litres of water (I really didn’t need that much). I will be prepared for my eight miles this weekend. 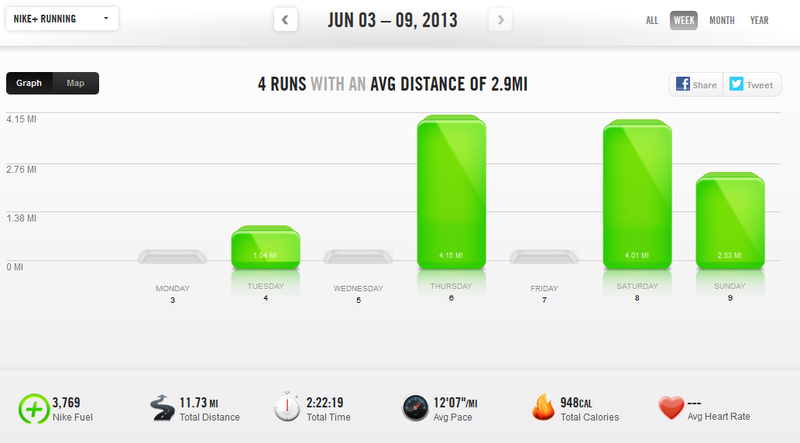 Nike+ isn’t showing my Sunday run on the graph, once again, but the totals are right. After taking Monday as a rest day, I knew I needed to head out on Tuesday. However, driving home from work, my car told me it was 96 degrees outside. Ninety. Six. Not counting the 50% humidity. I didn’t want to die, so I opted for the treadmill, which I suspect I will be living on through July and August. It’s been a couple months since I had ran on the treadmill, so I had forgotten how much easier it is. Pacing is no problem since it controls your speed. I don’t have to worry about hills. No wind. I also forgot that it’s boring. Especially when Roomba ate your headphones and you haven’t gotten a chance to fix them. It didn’t matter. I blew through my 28 minutes I was supposed to run for Couch to 10k and did 33 instead. Still only 2.5 miles since I paced myself slow on purpose. On a 1% incline, I started at 4 mph and increased 0.1 every 2.5 minutes, ending up at 5.1 after 30 minutes. Then I ran 2.5 minutes at 6 mph, using the last 30 seconds as a jogging cool down. That workout would have destroyed me three months ago, but it was a piece of cake now. Although the workout room didn’t feel a whole lot cooler than outdoors, and I had sweat literally flinging off of me as I ran. Wednesday was even hotter than Tuesday with the heat index topping out around 100 degrees, so I took a rest day and went out on a date with myself to see “Spirit of the Marathon II” for inspiration. The documentary follows seven people running the 2012 Rome Marathon and leading up to it. Inspirational, it was! I don’t know if I’ll ever run a full marathon, but I’m convinced I need to do it in Rome. (Paris would be cool, too, but I’ve never been to Rome.) I got a bit of a laugh when one of the runners went to buy some “runner torture devices”, aka the foam roller and the stick. It also managed to make me tear up in parts. Just see it if you get the chance. 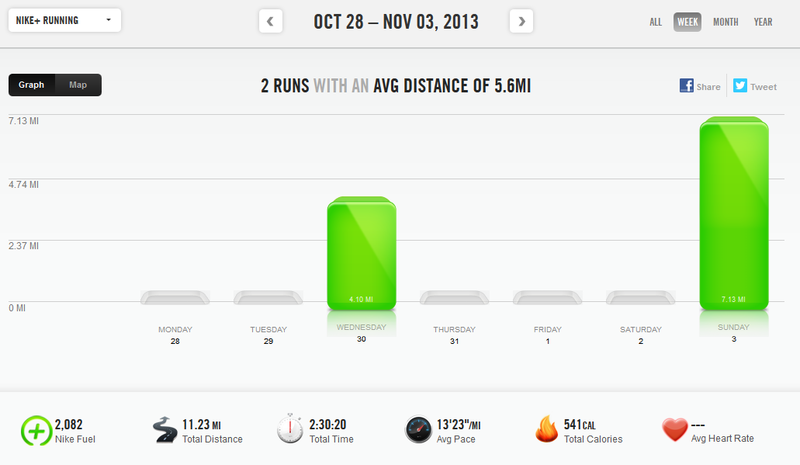 I wanted to get up early Thursday morning to fit in a mile, but my soleus was still kind of hurting. Will it ever heal? I went to see She & Him at the Ryman Thursday evening, so it turned into another rest day. Probably for the better, since I really need my calf to get better. Friday I drove up to Clarksville to visit my parents and got up early on Saturday to put in 6 miles of intervals. 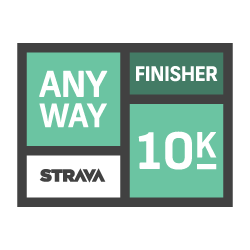 Strava had a challenge to run a 10k that day, so that is what I did. 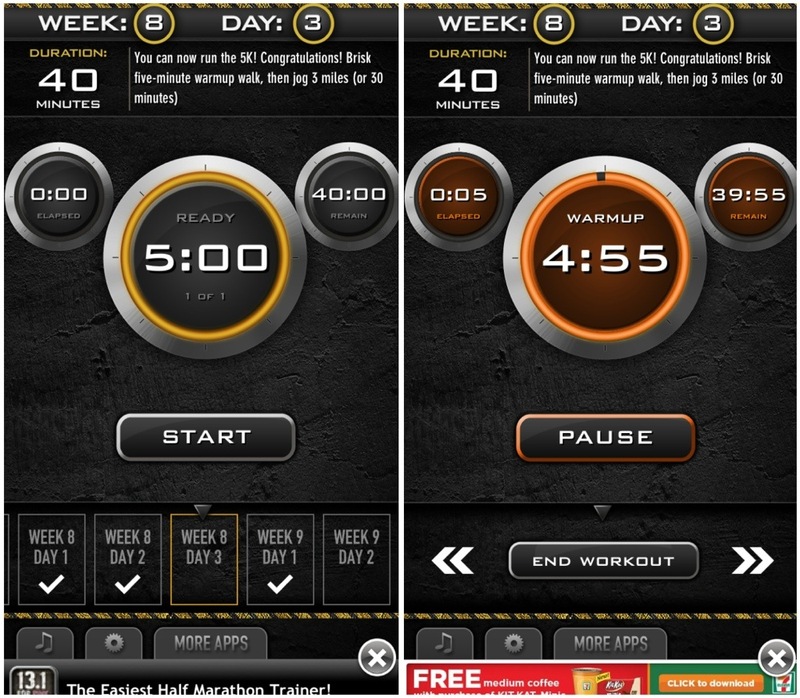 For the first mile, I did 2 minutes running, then 2 minutes walking. For the second and third miles, I increased to 3 minutes running. Then went up to 4 minutes running for the fourth mile. I wanted to increase again for the last full mile, but I was on a section of road where I was running into the sun and was low on water, so I ended up doing more of a 1:1 ratio again. Overall, I finished 10k in 1:17, which isn’t too bad considering it’s only the second time I’ve gone that distance. Hopefully I will be a little faster at the actual race in a couple weeks. My legs weren’t feeling too bad, so I went out on a recovery run on Sunday evening. I didn’t have an exact distance/time in mind, other than I wanted to do at least a mile and if I did a full 5k that would be pretty cool. But I didn’t want to push myself. It was supposed to be recovery, after all. I paced well on the first mile, but sped up after that and wore myself out after 2.8 miles. So just short of the 5k, I walked for about 3 minutes before finishing it out with a light jog. Still, I ran for over 32 minutes straight. Does that make me a Couch to 5k graduate since the last day is to run for 30 minutes straight? Even though I didn’t really run a full 5k? I’m counting it. On to the 10k!